We think this Camouflage Boutonniere is just downright clever! A burlap ribbon is formed into the shape of a wide petal to provide the base. Filled with a spray of natural feathers and a strip of camouflage fabric, its beauty is only matched by your love of the outdoors. 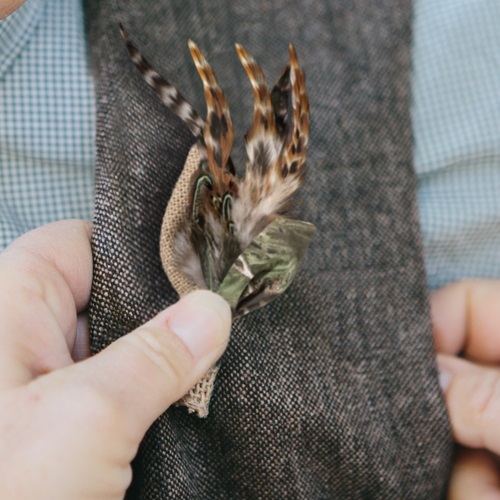 Use it just for the groom, or adorn all your groomsmen with it � and don�t forget the ring bearer and the Dads! Boutonniere measures 4" high x 1-3/4" wide. Your little ring bearer will take the outdoor charm one step further when he carries the correlating Camouflage Ring Pillow.